In 2016, Russian agriculture reaches its big success after such a long time decades of Soviet Era. Around 20 years ago, the country belongs to one of active wheat importer. And now they have proved that they can provide more than half of the world wheat market. Based on the data from Russian statistics agency (Rosstat), Russia became the world’s top grain exporter with a record production of 120 million tons of wheat. This is a great achievement in the agricultural sector. The production keep improving in 2017, in which gathered a record of grains harvest of 135 million tons. This is also followed by the great sales record of Russian wheat in 2018, in which it grew about 80% compared with previous 2017 sales. The farming regions where most of the harvest production is exported are from Siberia and the Urals, it is around the Black Sea and the Azov Sea. Those two regions have rather good and stable weather. Another harvest stock is from Volga region, then followed by Krasnodar and Stavropol regions. Usually harvest time is around May until the late July. The country of import destination is varying from the Middle East country, Asian country, Africa and also the United States of America. The Middle East country includes Algeria, Egypt, Lebanon, Turkey and Iran. They are importing greater quantities of wheat, meslin, and other grains from Russian farmers. As for Asian country, China, Japan, Hongkong, Thailand, Indonesia, Korea also imported grain in which Russian is producing. While Africa and America also purchase in a huge number to fulfill the nations need. Russian agriculture sector consists of farming, green housing, gardening and stock breeding. Each sector has contributed in the national food supply, but considering the most sectors in which Russian people dedicated is farming. Based on the agricultural data, more than half of Russia’s agriculture is farming with 80% is about grain production. Among these 80% of grain, 60% of it is producing wheat, while the rest is another grain. Russian farmers nowadays are trying hard to fulfill the target from the government to produce their own foods and to meet the import demands. As instructed by president Vladimir Putin in his government program that is to replace imported goods with home grown products by 2020. By the massive income from agriculture product than the income government get from other dominant sector such as industrial equipment product. Russia depends on wheat more than any other foodstuff like rice and maize as an important component for its food supply. 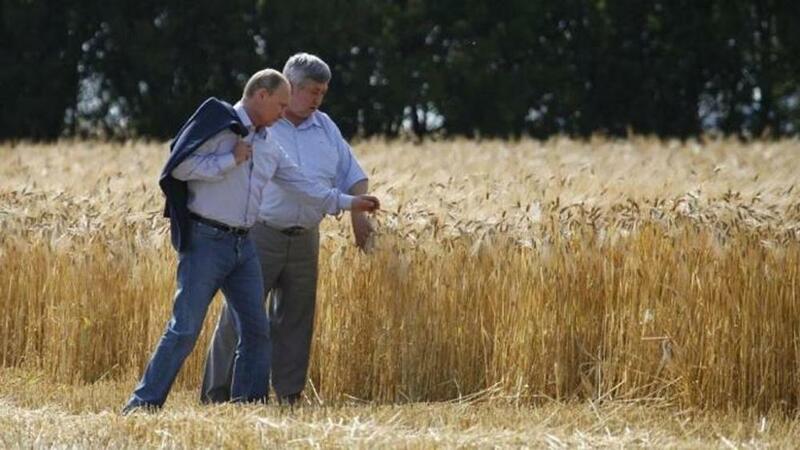 In fact, there is roughly 70 % of wheat produced in Russia. The annual production is mostly consumed domestically than later it is exported overseas. The far region of country that is Siberia to the westernmost regions near the border with Europe, wheat is a staple food production in most parts of the country. There might be any other food products like fruits and vegetables to rely on, but those are too temporal and easy to get rotten in a long term storage, especially that is seasonal which only can be harvested in such months a year. Not like wheat which can be harvest during summer and winter. Wheat is cultivated on more than 48 percent of Russia’s total area dedicated to grain and oilseed crops. Russian farmers cultivate it twice during both winter and spring seasons. Winter wheat is cultivated vastly in the Northern regions like Caucasus. Spring wheat is cultivated mainly in the Don Basin and in the middle of Volga region. For the tropical countries, weather might not be a serious problem in the agriculture productions, because commonly they have certain season times for best growing and harvesting. But here in Russia, the most important factor in their food production is weather. Almost many vegetables and typical fruits can only grow in summer, different from the berries fruit types which can grow well in cold weather. Thus, considering the importance of weather for food productions supply and demands, the government has facilitated the farmers in Russia by making up building storage facilities so that harvested crops can be stored for seasons with poor yields. Russia actually has a current total storage capacity of 120 million tons – but most of the facilities need to be upgraded, and so the government has made a plan to make around 130 million tons of capacity by 2030. Besides farming products, here we give the data of other agricultural products. From the livestock farm, they produce meat, including beef, pork and poultry, collectively rose 9% in 2016. Then Russian also produce dairy products which are currently helping Russia achieve 75% self-sufficiency in dairy output for the national economy. From the gardening products, they have kinds of fruits and vegetables which harvest volume increased by 2% in 2016, compared with 2015’s levels. In addition, green housing is now quickly securing a strong position in Russia’s agricultural mix. Around 600 hectares of greenhouse facilities have been built in Russia. The government is planning to transform into the world largest supplier of agricultural foods.